Hollins University welcomed to campus 12 delegations and nearly 100 students from middle school to college for the Fourth Annual Appalachia Regional Model Arab League (MAL), held November 9 – 11. Similar in organization and format to Model United Nations, MAL is the flagship student leadership program of the National Council on U.S. – Arab Relations (NCUSAR). Through role-playing, the conference allows both American and international students the opportunity to put themselves in the shoes of real-life diplomats and other foreign affairs practitioners and deepen their knowledge of the Arab world and it peoples. During this year’s Appalachia MAL, students discussed such issues as the Palestinian conflict, global climate change, building greater Arab unity, and promoting more private investment in the region. For the first time, all conference council chairs were Hollins students. 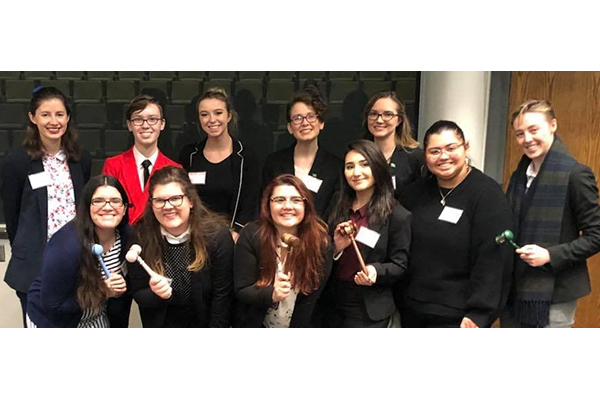 Notably, Hayley Harrington ’19 and Carly Collins ’21 acted as secretary-general and assistant secretary-general, respectively, while Hannah Jensen ’20 was awarded Outstanding Chair and Sami Makseyn ’19 was named Distinguished Chair. Professor of Political Science Edward Lynch announced that Hollins will participate in the National University Model Arab League conference at Georgetown University in April 2019. “Only 22 universities worldwide are invited to take part in the national conference,” Lynch said. In addition, he and Harrington will be traveling to the Arab nation of Qatar during Hollins’ Thanksgiving Recess as part of a faculty-student delegation sponsored by NCUSAR to the Persian Gulf Region. The delegation will meet with government officials, private business people, academics, and journalists. 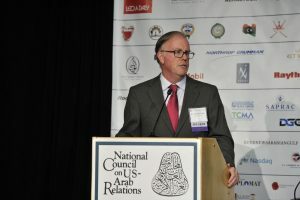 Professor of Political Science Edward Lynch addresses the Arab-U.S. Policymakers Conference on Nov. 1 in Washington, D.C. 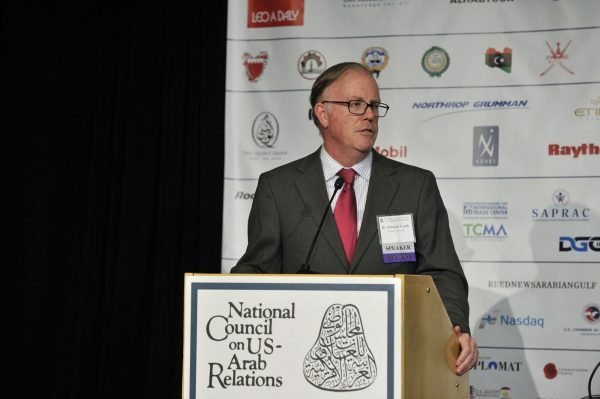 Earlier this month, Lynch was a featured speaker at NCUSAR’s 27th Annual Arab-U.S. Policymakers Conference in Washington, D.C. Before an audience of 350 people that included high-ranking policymakers from the U.S. and the Arab-speaking world, Lynch discussed Hollins’ active participation in MAL and the intellectual benefits students receive from it. Top photo: Hollins University’s delegation to the Fourth Annual Appalachia Regional Model Arab League. Hollins represented Saudi Arabia and Sudan at the conference.